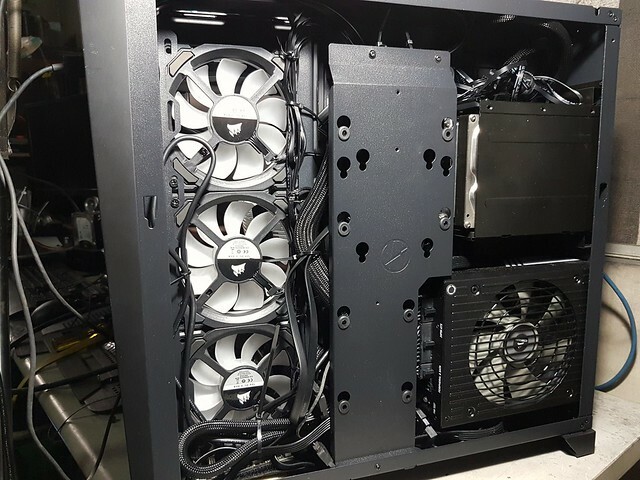 I didn't really want the PC-O11 Air, I had my sights on the Dark Base 900 Pro, or a Cosmos II or something "big" and it really was a $@$$^$% to manage all of that cables. How about trying to validate it with a benchmark? 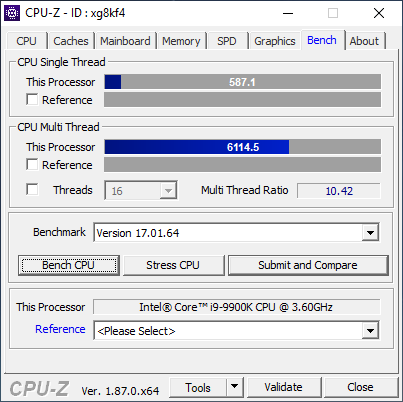 Cinebench or CPU-Z can be done really quick. If the performance aligns with 5.2GHz then sweet! If it is wrong then monitoring software might not be reading bclk correctly, though I often see this with Ryzen, not Coffee Lake. Well this is what I'm getting out of the box, no BIOS changes. Huh, can't believe it. Must have been a BIOS bug, coz I went in there again but didn't change any setting...exit without saving...and it's all back to 4.7Ghz normal Idle reading. Will try again with more demanding stuff on. Currently downloading Valkyria Chronicles and planning on picking up RE2 from Datablitz on the way home. There are boards that have Multicore Enhancement (MCE) or Enhanced Turbo enabled in the UEFI BIOS out of the box. Have you checked? 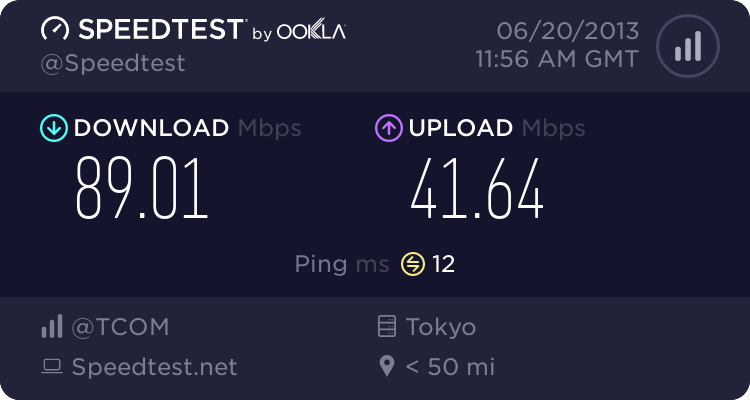 Not yet, but MCE was only upto 5ghz, not 5.2ghz IIRC. Shouldn't be the case. Gigabyte's Z390 Aorus boards don't have MCE on by default. "Gigabyte does not try to trick MCE into being enabled under auto or XMP configurations. This is the correct way to do it, we think: they’re offering an option, but not sneaking it into a state of being on, and so we commend Gigabyte for this arrangement. ASUS does the same thing, for reference." Can confirm MCE was off on my board as well. Manually switched it on for a quick-and-dirty 5GHz overclock. Well, I had to go to the BIOS to see if MCE setting was, sure enough it was in Auto. Exited without saving and the same odd i9-9900K before popped up. 90C isn;'t bad...but when in load, I noticed it just goes back to 4.7Ghz. 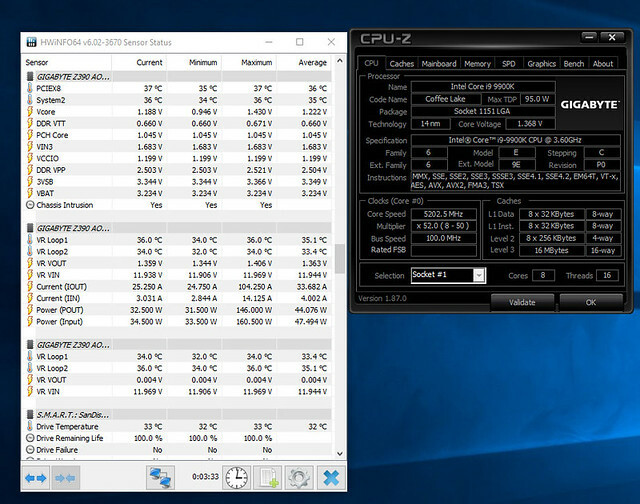 At idle it ramps back up to all cores at 5.2Ghz. Odd indeed. 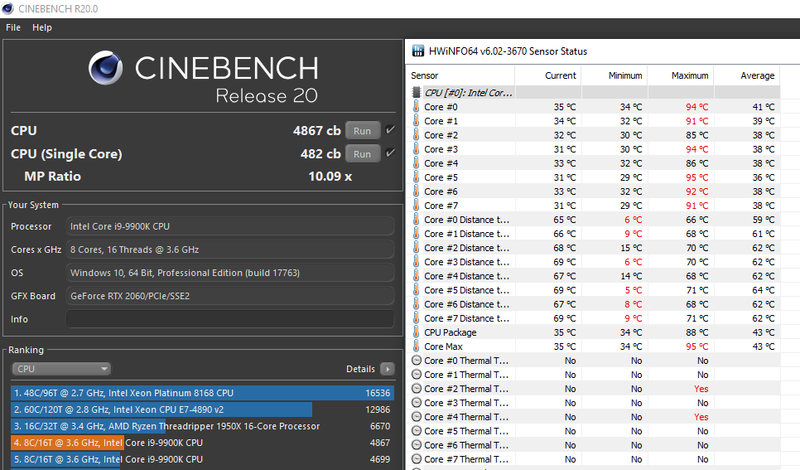 But when I validate it with CPU-Z, I see the expected numbers... 50 core multiplier max, 4.8Ghz when running validation. High vcore though. 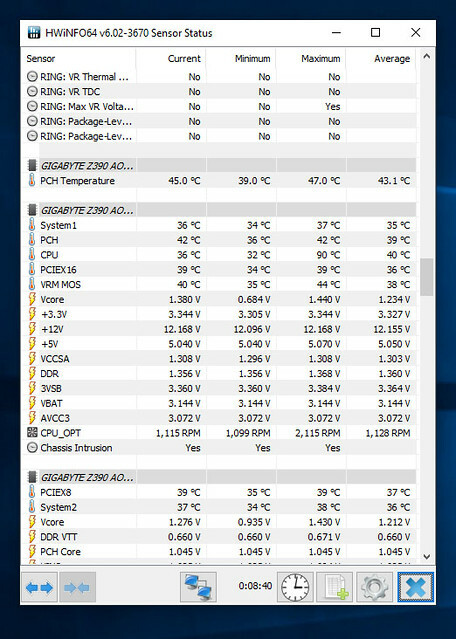 Am I risking burning the i9-9900K if I keep using AUTO on everything? Auto everything medyo mataas voltage because it's using Gigabyte's VID tables. 5GHz will be 1.38 I think, spiking to 1.4V+ as it goes off load (doesn't actually sustain 1.4V+ at load, but as the load ends and the LLC isn't able to back off quickly enough there's a short voltage spike). Problem with setting fixed voltage is it doesn't drop on idle. Best practice is to manually set the voltage, test the OC with Prime95 or your preferred stability test, then set voltage to "Normal" and then plug in a VID offset to bring the voltage back down to the tested stable level. Well I turned off MCE, boot into windows, confirmed its running in 4.7Ghz, Shutdown for lunch, powered on the PC, checked if MCE was still turned off. Booted...desktop icons jumbled up again (Arrgh, why won't it save it?) And sure enough running at 5.2Ghz again on boot. Rebooted, reconfirmed MCE is disabled. (Everytime I restart, this BIOS wants to put an old SSD in the boot priorities for some reason) removed the boot priority 2, saved. Booted in 4.7ghz again. This BIOS is nuts! 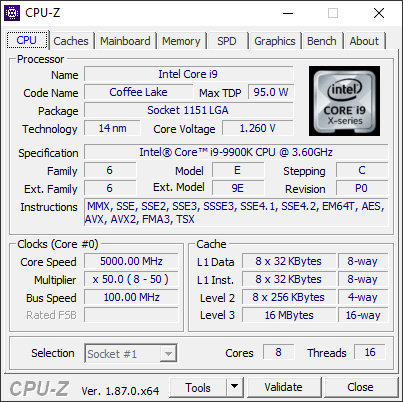 Have you tried benchmarking it when it's "5.2GHz" vs when it's running normally? I'm wondering if that isn't just a sensor readout issue. My stock CPU-Z bench is a bit below 6k, and it's just above 6k at 5GHz with MCE. 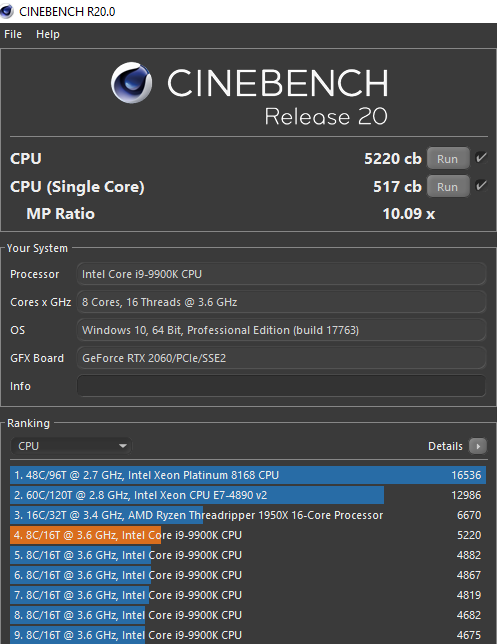 Cinebench goes from 2060 to 2195. If your score while it's "5.2GHz" is within striking distance of default then it's probably not the BIOS applying an OC by itself but something in Windows that's causing the speed to be read inaccurately. 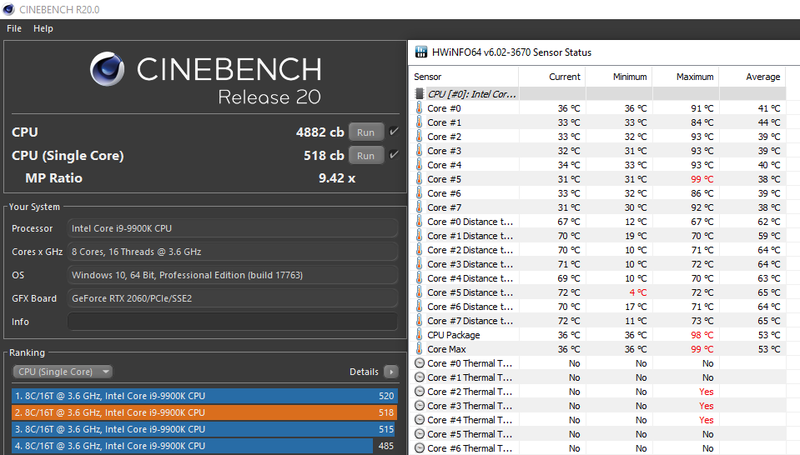 Looks like 5GHz is it for this chip, at least with the 240 AIO. 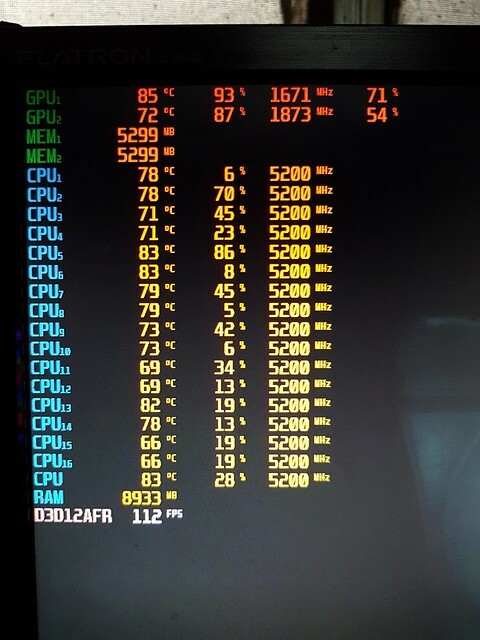 Not gonna bother trying for higher because with the AC off and 30C+ ambient it already thermal throttles in Prime95. 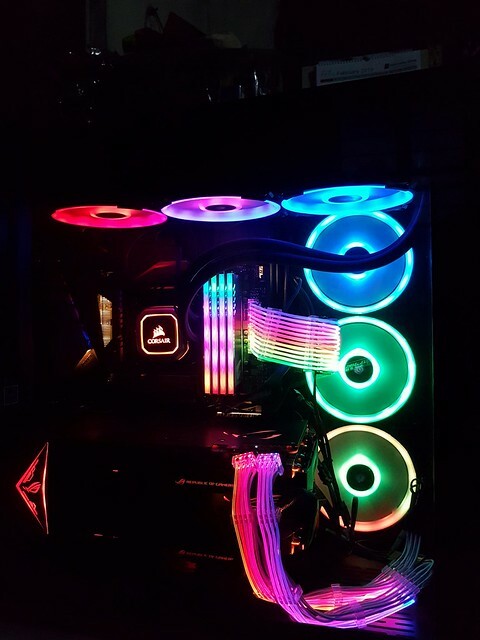 Performance seems to be entirely limited by the cooling. 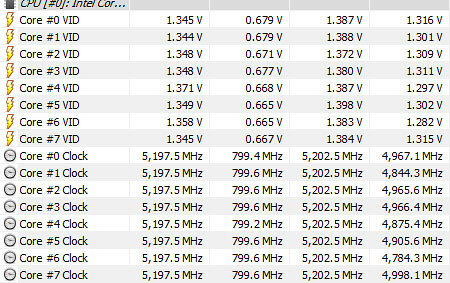 5GHz is barely faster than stock because my hot cores are going into thermal throttling. At higher ambients (AC off) 5GHz is actually slower than stock. Guess a 240mm rad is too little for this chip when doing rendering loads. Got better thermals (and CB20 results) by tweaking. Continued in the overclocking section because it's not really about the PC build at this point. lol I wasn't even planning to do this build. My original idea was to wait till DDR5 was mainstream, but the old motherboard had other ideas. On-board stuff started failing one by one, and eventually got to throwing errors at boot. Man I've been planning building a new rig for years now. Can't seem to start. The 6-year old Hackintosh conked out (bad RAM) last year.